Fact is, what we have here is failure to communicate. See, this photo may show the tender, marinated vegan chicken strips, the Daiya cheddar, and the fresh avocado that made this dinner exceptional; and yet it still doesn't really illustrate how good this recipe is. The warm tortilla hides the three different types of peppers, the red onions and the mushrooms that were essential to this remarkable dish. You can't taste how good this was with a cold beer on a warm summer night, or see how Mexican food, computer games, and a "New Friday Philosophy" can make even the worst week better. I'm a little late posting this because I tore up my hand on Saturday morning on a can of cat food and had to spend most of the day in the ER with a patient, understanding, and wonderful Dan; who only laughed once at my irrational and vocal needle-phobia. I admit that I made a bit of a spectacle of myself. We passed most of the time Jaws-style. I admit this wasn't our first trip to the ER together and we're a little competitive sometimes, but we had a nice time reliving our war stories and pointing out own physical imperfections to each other. Good news: expect more Dan posts this week! Bad news: now I have to worry about clones. To make the Marinade, mix all the Marinade Ingredients in a shallow dish. Slice or form your favorite Vegan Chicken into pieces about the size of the Pepper and Onion slices. Submerge the Vegan Chicken in the dish. Keep an eye on it; different Mock Meats behave differently. The Gardein was ready to cook in 5 minutes; other Mock Meats might take more or less time. You'll know it's ready when you squeeze it and 1 or 2 drops come out. You want to keep the marinade in the Vegan Chicken, so don't dab or squeeze out the Marinade. Don't dump the marinade when you're done with this step! You'll need it. Heat oven to 250. As the Vegan Chicken and Vegetables cook, put a stack of tortillas in the oven to warm. In your magic little cast iron skillet, heat the 2 Tablespoons of Olive Oil and the Dash of Liquid Smoke. Once hot, add the Vegan Chicken. Let the Vegan Chicken cook, moving and flipping it to get it evenly cooked. Once it starts to brown, add the Peppers, Onion, Mushrooms and the rest of the Marinade. Remove from heat when the Vegetables are tender and the Vegan Chicken is golden brown. 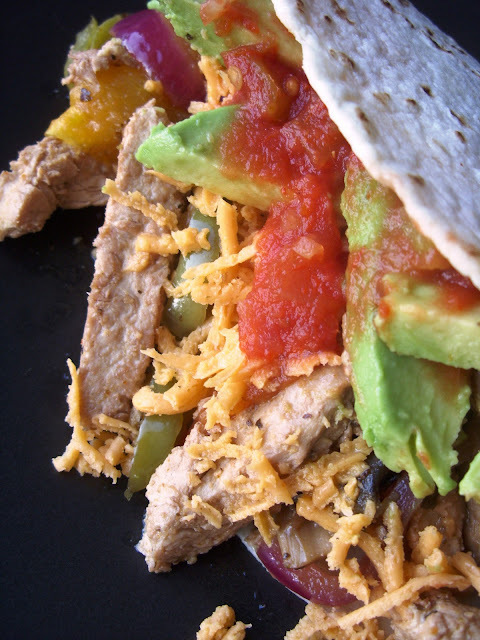 To build your Fajitas, place a warm tortilla in a plate and put either half or a fourth of the Vegan Chicken and Vegetable Mix on one side. Top with Daiya Cheddar, Avocado and Pico de Gallo. PS: This has very little to do with anything, except maybe chickens, but it made me laugh. That is all. that tequila marinade sounds great. i was thinking about making some seitan fajitas, now i know what marinade to use!